Ain't so. It's guacamole. And you'd be surprised at how tuna sashimi and avocados go super well together. 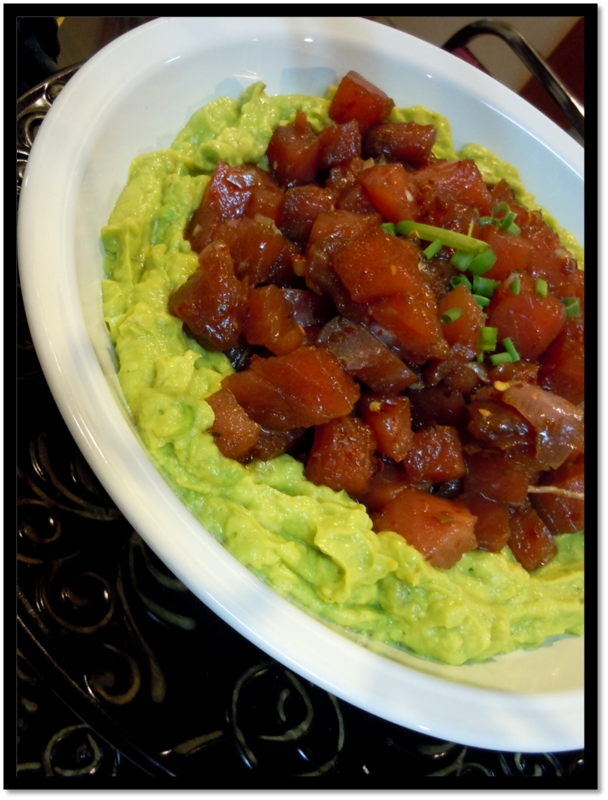 I got inspiration for this tuna poke from my super favorite food site- yumsugar.com, adjusting according to whatever's available in my cupboard. Read on on how to make them. 1.Prepare the guacamole by mixing avocado, juice of lime, salt and pepper in a blender. Pulse until smooth. Set aside. 2. Mix together Chili garlic paste, soy sauce, sesame oil, chili flakes. set aside. 3. Cut the tuna grade sashimi to small bite-size portions. 4. Mix in the sauce, and mix chopped onions. Top with scallions.